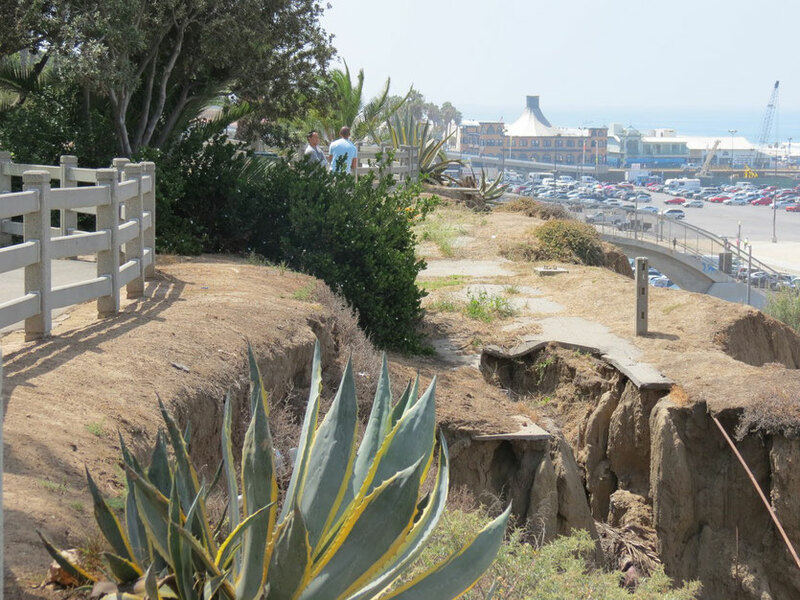 Palisades Park is under constant threat from erosion. 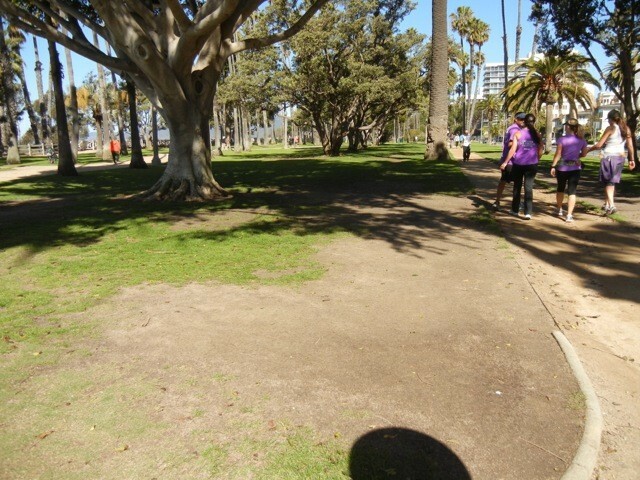 Every year some of the Park’s characteristically thin soils and the bluffs on which they grow, slips away, taking plants and trees with it. 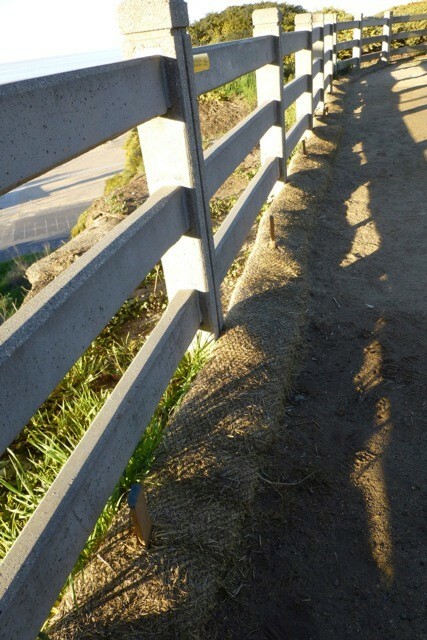 Since our earliest historic records, the bluffs on which Palisades Park sits have been crumpling onto the Pacific Coast Highway. 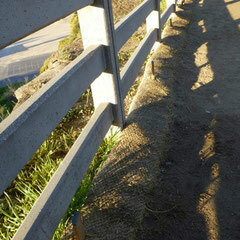 That is why the city creatred Palisades Park in the first place, to stabalize the bluffs. 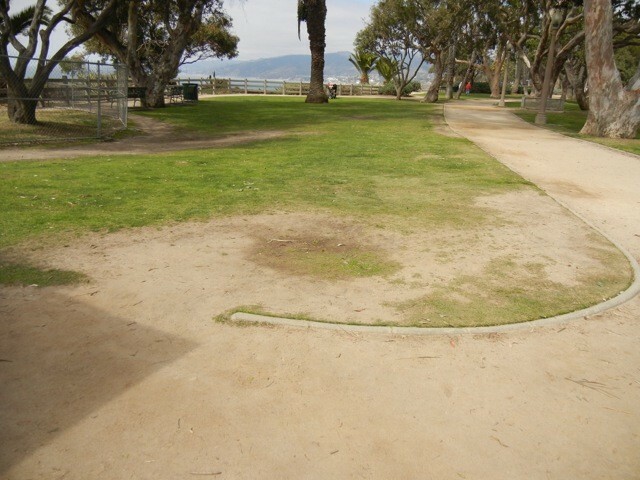 See more on the HISTORY of Palisades Park. 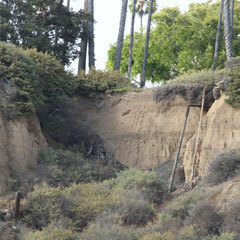 and why Palisades Park is naturally prone to landslides, slippages, and erosion. 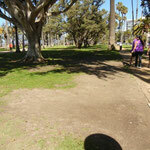 BELOW: Photos show park soils that are clearly not healthy and the cause is chiefly manmade. 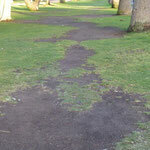 According to city staff only a few years ago these soils were all covered with new lawns. 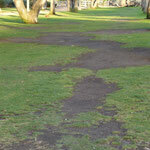 Humans leave a large footprint by the sheer number of feet that trod on it's ground. 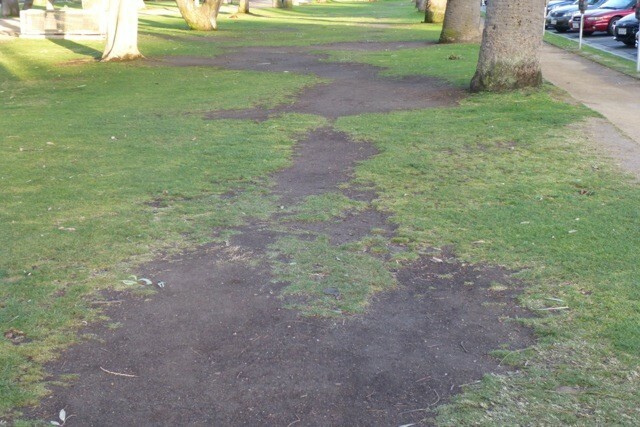 The soils and lawns have been trodden down by by the shere number of tourists, residents, and visitors that enjoy the park. 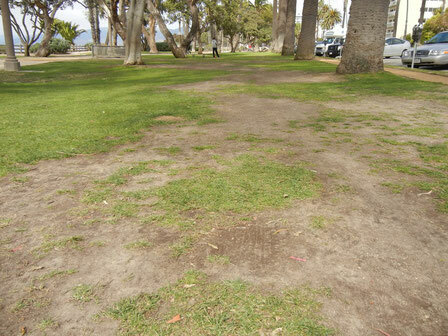 Some humans leave a lighter footprint and visit the park sustainably, but many others leave a damaging trail and are careless of their impact. 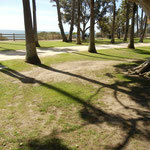 Below we hope to explain why we all should understand what is happening and support more sustainable use of the park. There are clear solutions to reduce the abuse and promote more sustainabile behavior. 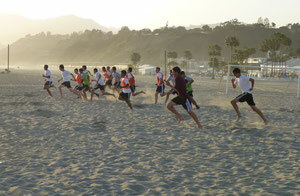 We offer clear solutions which we believe should be implemented immediatly. Not to address these concerns may have a dire impact not only on the Park's beauty, but also on the the stability of the bluffs. If you tread heavily on the soil, if you pound it repeatedly, if you jump and down in the same place, you’ll eventually pound the air out it. "Soil compaction is the physical consolidation of the soil by an applied force that destroys structure, reduces porosity, limits water and air infiltration, increases resistance to root penetration, and often results in reduced crop yields. " Compacted soils can cut crop yields by as much as 50% due to reduced aeration...poor internal drainage, and limited availability of plant nutrients." 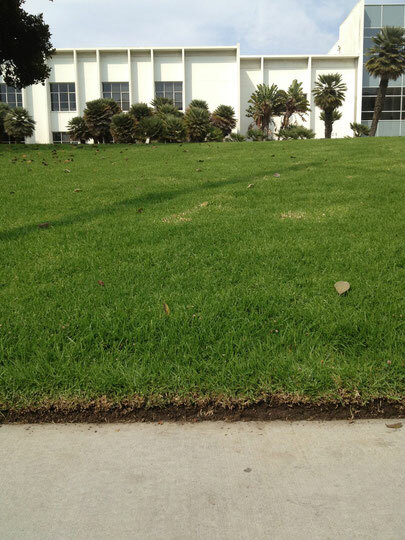 The lawns in front of City Hall are healthy soils. 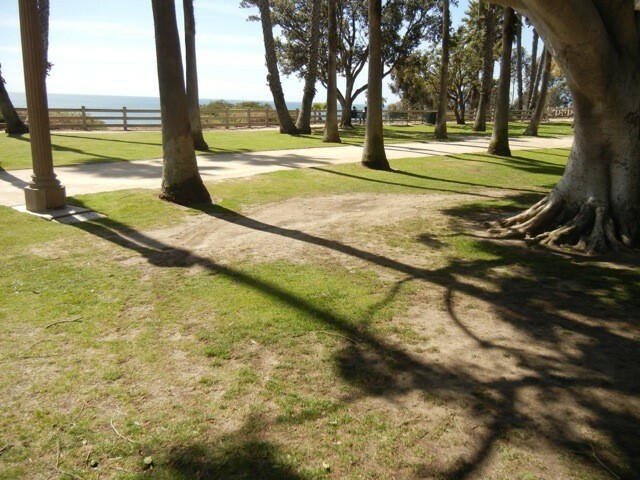 The depth of the root development, the texture of the soil, and the thick mat of living material show they are thriving. 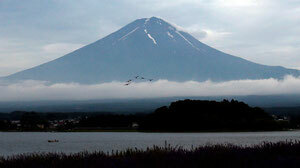 Chemical and gas exchanges move freely between the horizons. 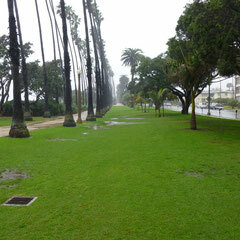 As a result these lawns are wonderfully soft to sit and walk and lie upon. Give it a try! 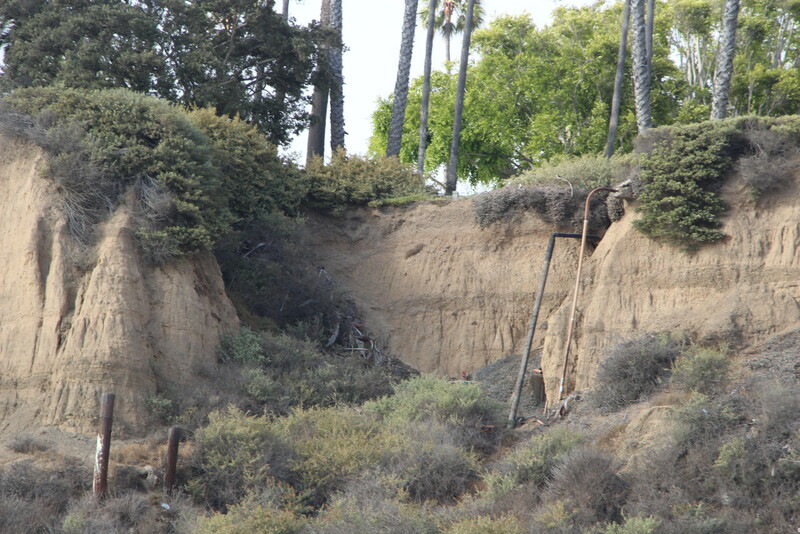 The California Coastal Commission describes the typical soils of a marine terrace, such as Palisades Park. "Grains of quartz, feldspur, and mica compressed into layers of sandstone crumble easily. 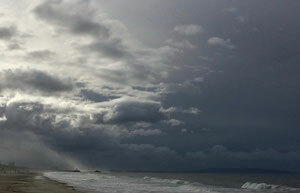 When wet, shales and sandstone disintegrate, and clays and muds soften and liquefy." 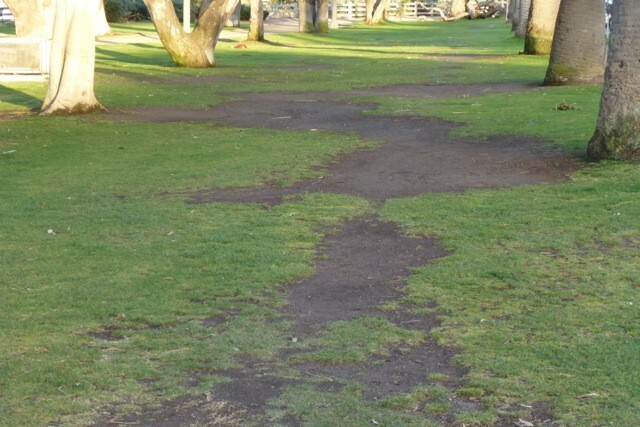 When rain lands on the Park's compacted soils it can't percolate and will run, causing erosion. 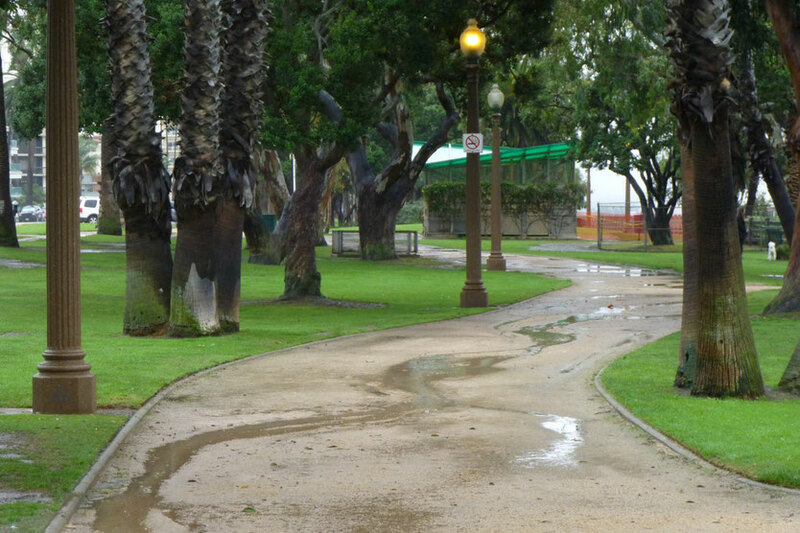 Rain flows off the lawn's compacted soils onto the paths, and over the edge of the bluffs. Every year, even in the recent years of drought, the stairs at Montana or the path at Idaho are closed due to erosion and slides. 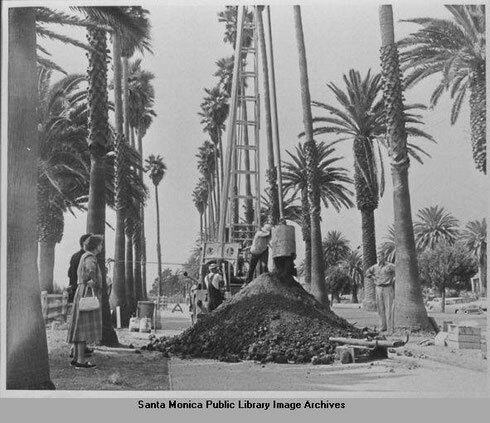 In 1956, after heavy rains and landslides, the city resorted to core drilling as part of the city's "Slide Prevention Program." As necessary as such actions may seem, we have major concerns with an engineering ONLY solution. For example, why isn't nature recruited into this effort? 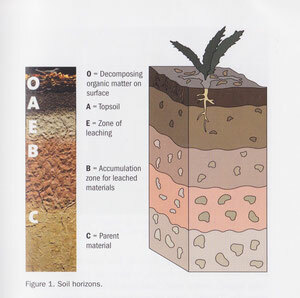 Please visit our section on GEOLOGY for more on this subject. 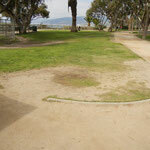 PLEASE SIGN THE PETITION: KEEP PALISADES PARK GREEN! 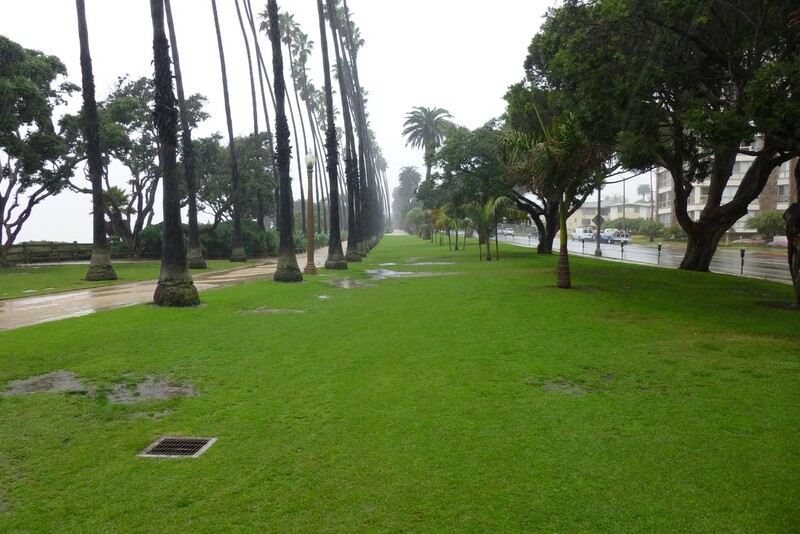 Learn more about the controversy over the current unsustainable use of Palisades Park.